It’s time to travel down the tracks with Thomas and his engine friends for mischievous adventures on the Island of Sodor in the all-new Thomas & Friends®: Railway Mischief that arrived on DVD April 9, 2013 from Lionsgate and HIT Entertainment. 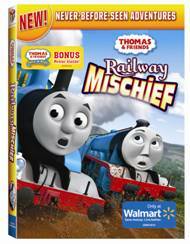 Featuring five brand new episodes and a bonus, collectible “Calling All Engines” poster, this DVD will be available exclusively at Walmart for a limited time for a suggested retail price of $14.98. So grab your train whistles, put on your engineer’s caps and get ready for trainloads of fun with everyone’s favorite Number 1 Engine! 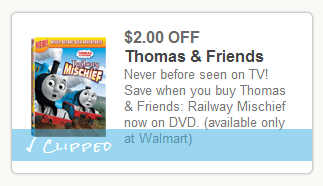 And make sure to clip and print this $2 off coupon above to get $2 off the Thomas & Friends: Railway Mischief DVD!